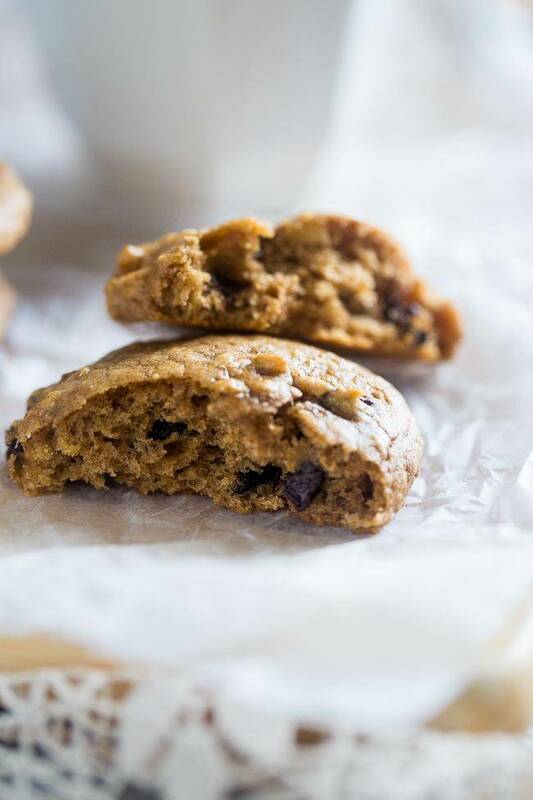 These gluten free chocolate chip cookies are naturally sweetened with banana and made with a secret ingredient so they’re high protein! Easy and healthy! It’s COOKIE TIME. Nah nah nah nah nahhhhh. I honestly don’t even know where that came from. 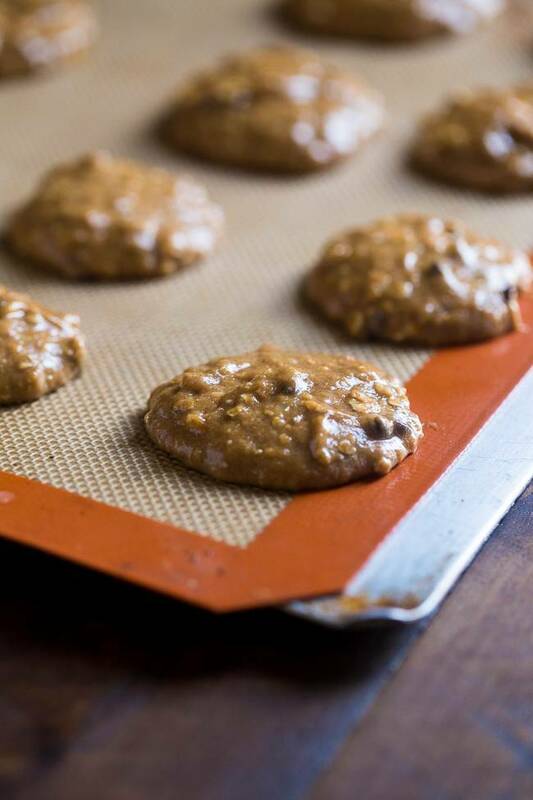 These healthy peanut butter cookies just told me that they wanted a theme song. So I gave them what their soft-chewy and just a lil-ooey-gooey-melty-chocolate-chip hearts desired. Quit googling therapists in the Washington Area. Mr. FFF has already beat you to it. Now pull up a chair, or an exrcise ball if you’re one of those “interesting” folk who feels the need to even burn calories when sitting down. Not that I’m judging you because being extra-uber healthy is jazzy and cool and HIP. On second thought, I’m judging you. Leather sofa > exercise ball. TRUTH. Pull up whatever your sitting-person-self likes and let’s chat about chocolate chip cookies. That are sort of cookies but also sort of mini muffins and A-L-S-O sort of pancakes. You’re confused. Stay with it. It’s going somewhere YUM. 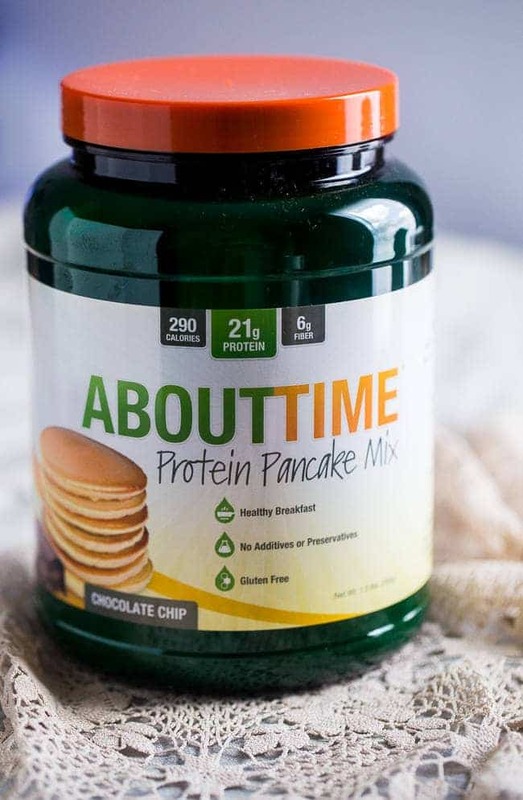 BECAUZZZ they’re made from About Time’s Protein Pancake Mix! We discussed it previously in its actual, true, protein pancake form. But then it told me that it wants some variety in its just-mix-it-with-water-and-it’s-so-good life. I see you opening a new tab, with your fingers hovering over “G-O-O-G-L-E.” STAP IT. I totally understand its thought process though. Water is good. But bananas and peanut butter are better. <– Solid life statement right thurr. Ever since the Breakfast Bars last week, I have been kind-of-sort-of-okay-TOTALLY obsessed with using bananas in place of eggs. Or in place of sugar. Basically, I have just wanted to shove bananas into absolutely anything that is also shoved into my mouth. Except zucchini lasagna. That’s weird. Not that I learned from experience. Hypothetically speaking. So. Obvi I had to add some banana into those cookies for the hint of sweetness that they needed. And peanut butter. Because it’s peanut butter. It really doesn’t need explanation. It also happens to be MADE for bananas. Like, they could just skip through fields of daisies hand in hand ALL DAY LONG, braiding each other’s hair, and no one would even bat an eyelid. That kind of made for each other. 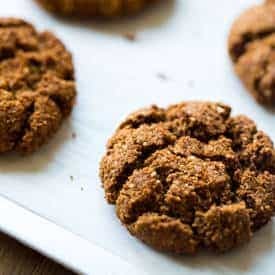 And these little bites of general food heaven and D-LISH are made for your protein-loving-healthy-breakfast-soft-and-chewy-but-kind-cakey cookie loving face. Especially since above mentioned face can be full of ‘em in 15 minutes FLAT. Like, from start TO YUM. 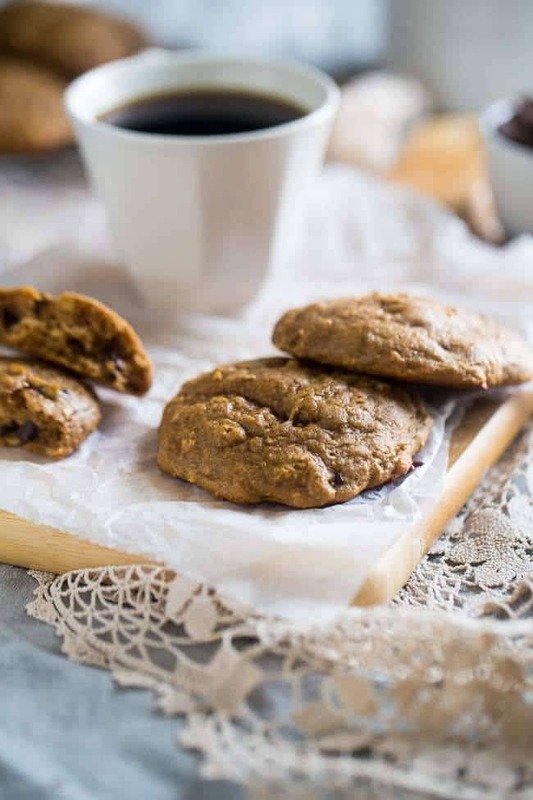 These gluten free chocolate chip cookies are naturally sweetened with banana and made with a secret ingredient so they're high protein! Easy and healthy! In a large bowl, combine the mashed banana, peanut butter, coconut sugar and vanilla extract. Mash together with a fork until the evenly combined. Add in the Protein Pancake Mix, quick-cooking oats and a pinch of salt and stir until evenly combined. Your dough will be wet and sticky. Drop the dough by heaping tablespoons onto the prepared pan. Bake until the tops of the cookies just look baked, about 8-9 minutes, being careful not to over-bake as they will dry out. Let cool on the pan for 5 minutes and then transfer to a wire rack to cool completely. I’m guessing gluten free doesn’t mean calorie free but who cares! I’m gonna eat the whole batch of these lovlies! Haha we can just ignore that right 😉 Thank you Tori! Your pictures are just stunning, Taylor! I want to reach right through my screen and grab a cookie (or five). 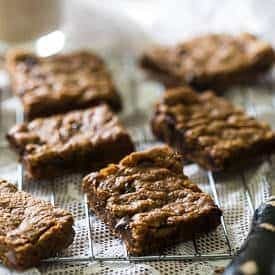 Love that these are gluten-free! My sister-in-law can’t have gluten, so I’ve got to make these for her! THANK YOU. I have been struggling with light in my new place and I am finally sort of okay with these, so I appreciate it! 🙂 Thanks so much Gayle! I am so glad to see these great pics in your post. They are lovely. And breakfast cookies are the best invention ever. You are the best! <3 Thank you so much girlfriend! 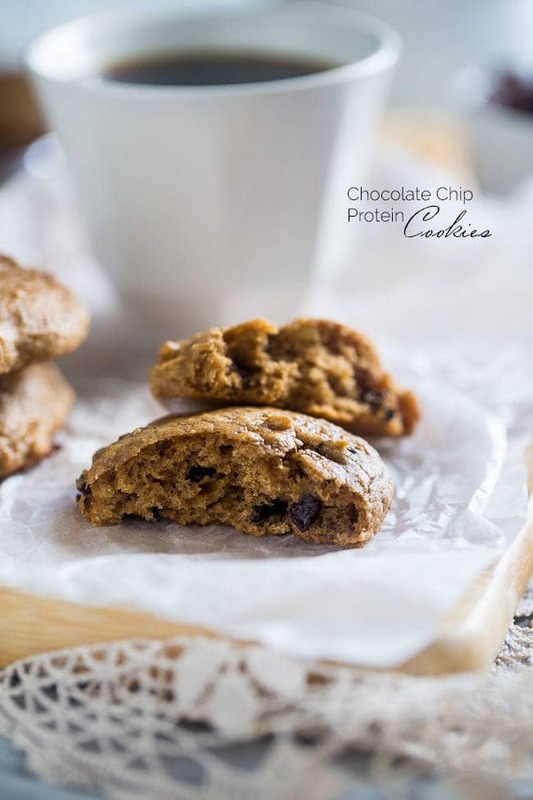 Love that these cookies are protein packed! 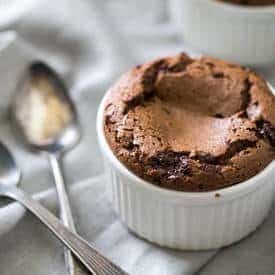 Also love that you made them out of a pancake mix, so versatile! Hello cookies for breakfast! I mean there’s, pb, banana, and protein pancake mix in them so they’re totally breakfast worthy! Pinned! Actually calling the therapist right now. WHO WRITES THEME SONGS FOR COOKIES? This is such a great idea! I was literally sitting at breakfast this morning, eating About Time pancakes, and telling Vegas about the time I used Bisquick to make cookies. Why didn’t I think of it with this?! Can’t wait to try it! WOO HOO! Please let me know if you do try it! Thank you Laura! 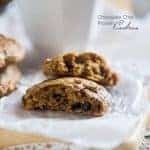 It makes a really light and fluffy cookie! HAHA YES! I am so glad it’s not just me 😉 There’s a time and place to work those abs! well these sound kinda awesome! Since they are packed with protein, I can eat them for breakfast right? I HIGHLY suggest you do 😉 Thanks Julianne! What a great idea to use the pancake mix! These look awesome! Isn’t it so magically delicious?! Thanks Sarah! Exactly, it’s all about fooling those taste buds 😉 Thanks Dorothy! 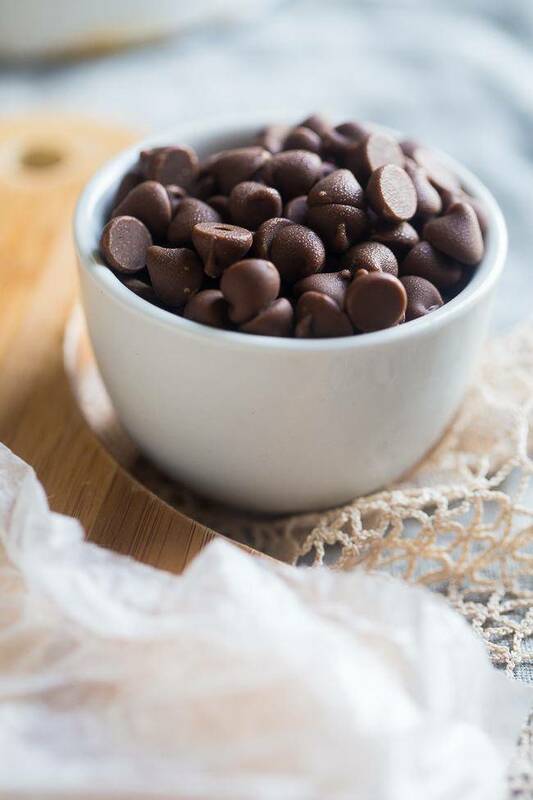 Are you like me and you keep your chocolate chips in the fridge or freezer?! YESSSSSSSSSSSSS can you tell by the photo hahaha?! The second QUEST comes out with vegan protein I am going to go bananas for it! I’ve literally seen TryAboutTime everywhere! Is it really all the hype? It’s great Cassie! You need to try it! ps. these cookies look awesome! Haha, YES. Then my work here is done 😉 Thanks Johlene! I’m amazed by how many things I’ve been able to make with About Time pancake mix. The cookies look delicious! Right?! It’s so good! Thanks Jill!